Flowers at Enchanting Floral Gardens of Kula, Maui, Hawaii (USA). April 30, 2009. 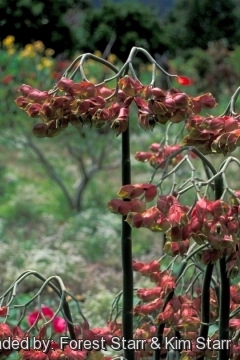 Origin and Habitat: Widespread in west Mexico from Sonora to Guerrero. Habitat: It grow on flat or slightly rolling land and at the edges of dry deciduous woodlands. Ecology: It is believed that the flower is pollinated by hummingbirds and insects. 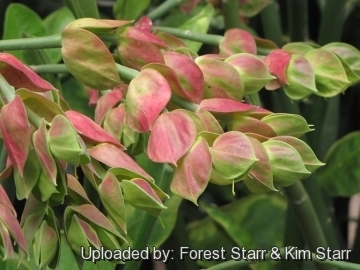 Description: Pedilanthus bracteatus (Euphorbia bracteata) is a small evergreen or deciduous shrubs growing to around 1,8 m tall (to 3 m tall in habitat), 0,9-1,2 m wide that branches profusely from the base; It produces abundant flowers (cyathia) with somewhat shoe-shaped reddish-coloured bracts that give this species the common name Slipper Plant. 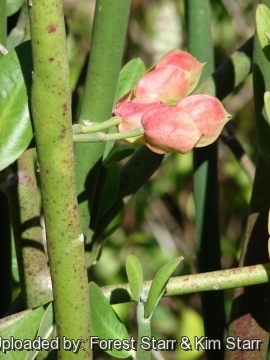 It is related to Euphorbia antisyphilitica. Stem: Branches, upright, succulent, wax-coated, narrow, cylindrical, green, scabrous or sparsely hairy and leafless before flowering. Leaves: Just near the branch tips, ovate. 4,5-10 cm long, 25-6 cm wide, with a thick keeled midrib beneath, glabrous to pubescent; petiole 3-4 mm long. Blooming season: In the warmth of late spring and summer. Fruit: Capsule, subquadrate, shallowly 3- lobed. 10-13 mm in diameter. Peduncle 7-12 mm. 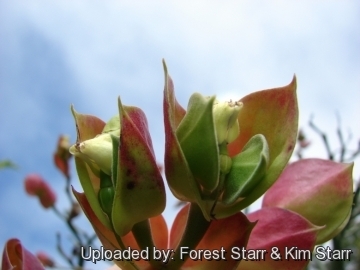 1) Forest & Kim Starr “Pedilanthus bracteatus (Slipper plant, candelilla)”. Plants of Hawaii. <http://www.starrenvironmental.com>. Web. 27 Sep. 2014. 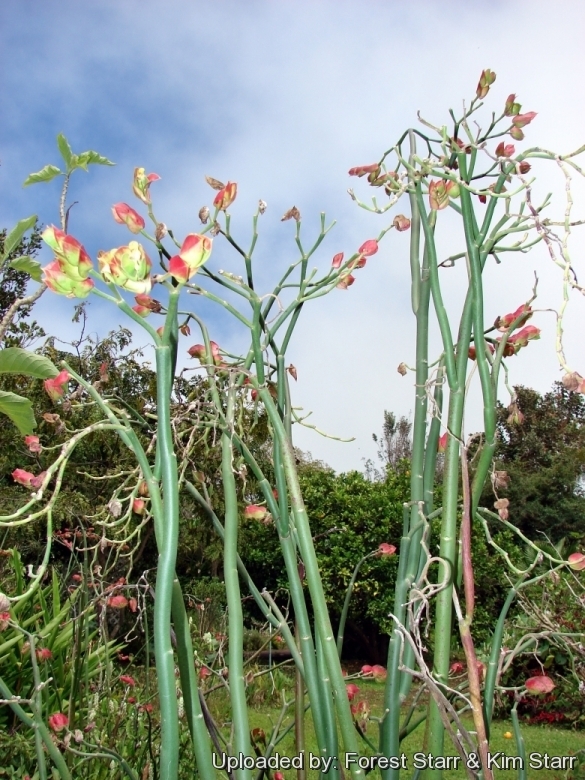 5) San Marcos Growers “Pedilanthus bracteatus - Tall Slipper plant”. <http://www.smgrowers.com>. Web. 05 Oct. 2014. Cultivation and Propagation: Pedilanthus bracteatus (Euphorbia bracteata) is a relatively fast grower succulent in frost free zones and also a great container plant for full sun to partial shade. It is probably a winter grower and need water from October, when the new leaves can be seen forming on the growing tip In April the leaves begin to go yellow and drop off, so now it rests quite dry in to summer. 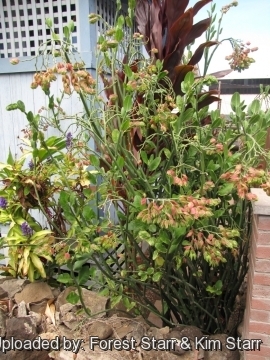 But others suggest to water it moderately all year round as it tends to be an opportunistic plant that tend to grow in each time of the year whenever it has enough water in fair weather and rest when temperatures are too hot or too cool and may have several or sometimes no growth cycles in a year. It must be grown very hard in the nursery as close to the natural conditions as possible. This ensures that it keeps its compact habit. Soil: Give the plant a well drained, airy, growing medium which mainly consists of non organic material such us clay, pumice, lava grit, and only a little peat or leaf-mould. Irrigation: It prefers to be on the dry side with good but infrequent waterings but looks best with regular watering in hot months. Less water during winter. No water should ever be allowed to stand around the roots. But it adapts to different growing conditions from extreme heat and drought, to high moisture as it has a low rot potential. Warning: Most species in the Spurge family have white latex, a milky sap in the plant's stems and leaves that is poisonous. Be careful when handling it as the plant may cause skin irritation or allergic reaction. Propagation: Seed or cutting. It is easy to propagate by cuttings in late spring to summer, just take a tip stem cutting directly into the soil after milky sap has totally flowed out. (preferably dry, loose, extremely well draining soil).